6 AT WHAT POINT DO WE FEEL CONFIDENT IN MAKING THE DIAGNOSIS? 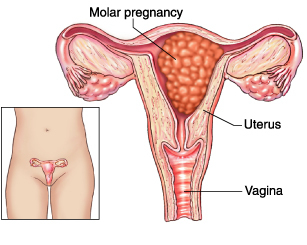 A hydatidiform mole (molar pregnancy) is a abnormal (but noncancerous) trophoblastic growth in the uterus that develops as a result of a non-viable pregnancy. Elevated hCG levels are characteristic of this condition. Ultrasound can show different findings based upon the type of molar pregnancy. AT WHAT POINT DO WE FEEL CONFIDENT IN MAKING THE DIAGNOSIS? Suction dilation and curettage is the preferred treatment for this condition.